In seeking options for preventive breast screening, thermography offers a safe, natural alternative. It’s very important to remember that often, there are no signs or symptoms of breast disease, and that is why regular preventive breast screening is so important. A preventive screening focuses on finding pathology in an early stage, while it is easier to treat. A preventive screening does not prevent cancer. Preventive breast screening entails checking the breasts for signs or symptoms of disease before it becomes a problem. There are different options available for preventive breast screening and various health organizations have different recommendations regarding at what age screening should start, how long it should continue to be performed and how often it should be done. These recommendations are often based on a woman’s age and their risk level of getting cancer. Choosing a breast screening method is a very personal decision and should be made after doing research and weighing out the pros and cons of each method so that an informed decision can be made. It is important to take into consideration not only one’s own risk factors for developing breast disease, but also any risk factors that may come along with having the screening procedure itself done. 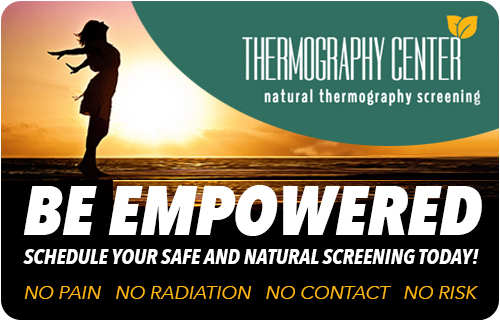 Thermography is safe and natural procedure. Thermography is a safe, non-radiologic option for preventive breast screening that doesn’t present any risk factors such as radiating the body or traumatizing sensitive breast and lymph tissue. It can be seen as complimentary or adjunct to other screening exams. Thermography can provide information that other screening exams may not be able to provide and without any adverse effects, invasiveness or discomfort. A thermographic breast screening is performed using a computerized, high-resolution thermal imaging camera. Strict preparatory and procedural protocols are followed when doing a thermographic breast screening. Patients are instructed before the screening to arrive with the body in as clean and neutral a state as possible without anything on the skin and not having done any activity which could alter the body’s temperature. The room is kept at a temperature that will not heat up the body. The camera evaluates the body’s temperature as an indicator of risk level for developing breast cancer. Thermography looks for inflammation and physiological stress that could be indicative of problems that will develop in the future, such as a developing a tumor and has the ability to see changes in breast health 8-10 years before other screenings. The ability to see cell proliferation and new blood vessel growth before a tumor really begins to grow is key for early treatment. It is the hallmark of a Thermographic scan. Regular preventive breast screening exams are essential for breast health. Having a thermal breast scan is an option that not only assists women with monitoring ongoing breast health, but also promotes overall wellness by not introducing harmful variables to the experience.